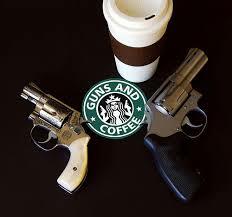 Starbucks is now ‘respectfully’ requesting that gun owners do not carry their firearms into their stores after a letter from citizens in Newtown, Connecticut sent a letter to Starbucks requesting an outright ban…REALLY??? Not that I am party to the liberal mindedness of Starbucks and I do realize that private property (ie store owners) can outright ‘ban’ firearms on their property, (such as the AMC movie theaters do…make a connection there??? And lets think about the other ‘no gun zones’ too where bad things have happened). I would question the reasoning behind their motive of ‘respectfully’ requesting that no ‘guns’ come into their stores, after all, a lot of ‘meetups’ occur in Starbucks where gun owners openly carry their firearms into the store, sit down and drink their coffee…and NOT ONCE HAS ANYTHING BAD HAPPENED. Geeze…have you ever heard of the saying ‘when seconds count the police are only minutes away’? Really Starbucks? Now you are openly telling those who would seek to harm others or rob you, that your stores are ‘gun free’ (respectfully of course). Ever wonder why 7-11’s and other convenience stores openly courted police officers to come and get coffee?? In the risk assessment arena that now places you up there on soft targets. I used to enjoy a cup of joe once in a while from Starbucks inspite of their liberal socialist views, but this is my fare thee well parting…I am not going to be a sitting duck. Politics are one thing, but safety is another and no cup of coffee is worth my life being put in jeopardy.